These Raspberry Lemon Fouls were definitely the star of the show. At something like an Oscar Party, your menu has to consist of a few luxurious items. These Raspberry Lemon Fouls did just that. The best thing about adding these to your menu for any dinner party is that they can be made the night before, cutting down on prep time the day of. I’m telling you, dishes that can be prepared ahead of time are a life safer. And, how cute are these served in an array of glasses? Update on my movie count, it’s looking pretty good, with two weeks left until the big day, I’ve seen all of the best picture nominees, plus many of the other films in the remaining categories! Following directions from the package of gelatin, soften it. In a food processor or blender, puree raspberries with lemon juice, zest and sugar. Once pureed, pour in gelatin in a steady stream. Continue to puree until the puree becomes slightly thicker. Taste for seasoning, add more sugar if necessary. Next, whip cream using a stand mixer or hand mixer until soft peaks form. Gently fold in the raspberry puree. Using a spoon, fill the glasses halfway with cream mixture. 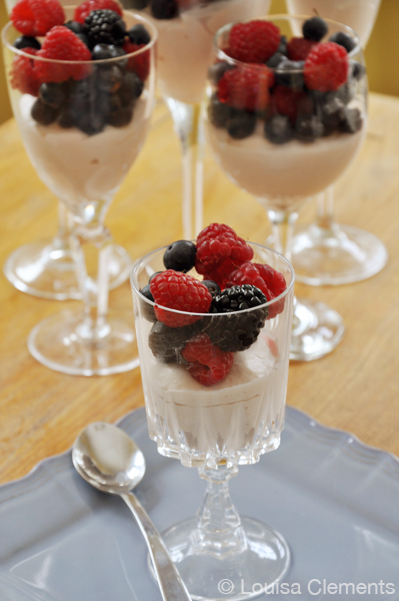 Top with assorted berries. Refrigerate overnight for best results. Definitely plan on making these Raspberry Lemon Fouls for your party, or any dinner party coming up.